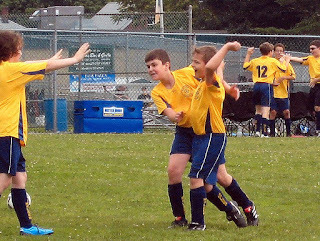 Ideally, youth sports provide a child with opportunities to experience events that in some way enrich their life. Giving a child the chance to succeed or fail in a memorable way is one such opportunity. But several years ago, a new assistant youth director decided that these tournaments weren't in the best interest of kids. He believed that too many kids walked away disappointed. Time has passed, the youth director has moved on, and the new youth director was willing to bring the tournaments back. Is that a good thing? I believe so. Season-ending tournaments often generate memorable moments. Through my years of coaching, I've experienced many of these. But here's one example that clearly shows how success and disappointment can both be part of a unique life experience. In a 4th-6th grade basketball tournament at the local YMCA years ago, my team was a low seed. Having won only a couple of games during the regular season, no one expected that we would go far. Nevertheless, we made it all the way to the championship game. On the way, we won two overtime games with one of my players, Luke, sinking shots at the buzzer. Everyone was excited. But just a few minutes into the final game, it was clear that my kids were physically spent. We lost. As to Luke, he went on to enjoy a successful high school sports career and played baseball in college. I happened to run into him a few years ago. Out of curiosity, I asked Luke if he remembered that tournament. Given his later success in sports, I wasn't sure how he would respond. He smiled and said that those memories were still with him. As we talked more, it was clear that he enjoyed reminiscing about that youthful heroic moment. The flip side of an exciting "win" is a disappointing, sometimes crushing, loss. In so many of these instances, though, there are positive moments. These losses can also lead to the child learning a life lesson (in a relatively safe environment). Kids learn to deal with dashed hopes. After the initial disappointment, losses are placed in a larger perspective. In the tournament mentioned above, we were disappointed not to win the final championship game. But my team knew how far they had traveled. They knew that they had given their best effort and along the way experienced some incredibly exciting and rewarding moments. I’m always saddened when I see administrators or parents in organized sports limit these opportunities. Intending to “save kids from being disappointed” and not “ending a season with a loss,” they instead deprive children of their possible big moment. Although sensitive to disappointment, kids are resilient. Events that result in a flood of tears are quickly forgotten with the child’s next success. Don’t remove, out of a misguided desire to protect a child from disappointment and loss, the opportunities to experience memorable moments.